The constant changes, transitions and development in the business world is a landscape that budding entrepreneurs might need some guidance navigating. 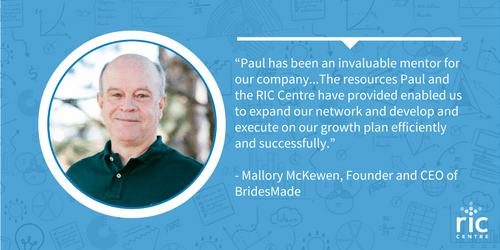 Mallory McKewen, Founder and CEO of BridesMade, is currently working with one of RIC Centre’s Entrepreneurs-In-Residence (EIR), Paul Barter, to improve her business. As an EIR, Paul meets with dozens of clients and helps them scale up, commercialize, and become a success in the market while surveying all the possibilities through a business and technological lens. Through his work, Paul noticed the problems and challenges surrounding the information technology component of entrepreneurial startups. When trying to reach out to an audience through platforms such as social media, it is important not to confuse the target market with one’s ideals. Paul puts it quite plainly: “I am not my Target Market.” The idea is to look towards the market, and cater to them. Paul also encourages his clients to converse with customers right away for a diverse range of opinions. As a management consultant, venture investor and MBA strategy professor, Paul draws his enthusiasm and knowledge from a diverse background and brings them to his interactions with his clients. When entrepreneurs come to Paul with ideas, he helps them identify the possibility of success. “Companies with great ideas get their product commercialized,” says Paul. “It’s important to create value, but it is also important to capture that value.” With that philosophy, Paul and his mentees figure out how to effectively use their time to reach their goals. You can find out more about what Paul does here. Looking to get advice and mentorship for your business? See how the RIC Centre can help by registering as a client today and get in touch with one of our Entrepreneurs-in-Residence! Don’t forget to visit the RIC Centre Events Calendar to find out more about our upcoming events and workshops.